Before being replaced by the new vehicles from the SCORPION programme (Contact Synergy Reinforced with Versatility and Enhanced Information),a final version of the VAB is ordered by the DGA. Intended for exterior operations (OPEX), the VAB Ultima benefits from many technical improvements resulting from experience feedback (RETEX) from recent operations. It is equipped with protection and equipment against improvised explosive devices (IED), a remote-controlled 12.7 mm weapons station allowing the operator to remain inside the vehicle, and an acoustic sniper-location system (SLATE). It is also compatible with the FELIN system (infantry with integrated links and equipment). 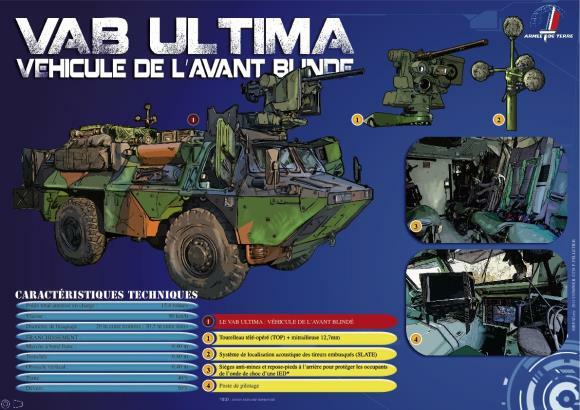 Two versions of the VAB Ultima were supplied: one for the infantry (230 vehicles) and one for engineering (60 machines).